What does "Default To Previous Value" do? Settings up a field to default to the last value that was entered. The Default to previous value option can be found in the field settings popup. 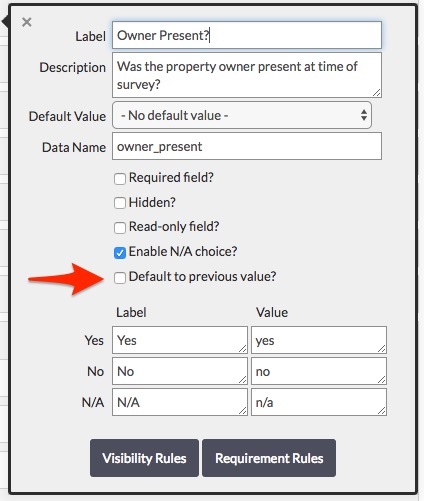 When enabled the field will automatically populate with the value that was previously entered into that field. This allows data collectors to quickly capture new records when much of the values are the same for a series of records. This is a localized feature for the Fulcrum mobile apps, meaning that it only retains the last value that was entered on the device being used. It will not automatically populate a value that was previously captured on another device. It’s intended to be a simple feature for speeding up individual collection tasks that are repetitive, to avoid having to re-type the same text string over and over for nearby records — valuable for things like text for street names or picking the same picklist items for successive records. This feature does not work on the Fulcrum web app.